The Meeting was held at St Edburg’s Church Hall, Bicester. Sixty eight members and eight guests were present at the meeting. Bob Hessian introduced Tim Porter, who made a welcome return to talk about historic clues that churches can provide relating to their long and often colourful past. Tim introduced the topic by suggesting that there are a number of questions that can be asked when visiting a church that will help to add to the understanding about the history of the building. Two important indicators of the history of the building are the geology of the building materials and the weathering that these materials have been subjected too. Building materials can include wood, brick or stone. The character of the church can be reflected by the local building materials and form unique styles in differing locations throughout the country. A limestone building material in the Cotswolds can provide very different characteristics from the granite materials of the West Country. Where there is a mixture of materials differing weathering rates can cause structural problems. The wealth of the parish can be reflected in the choice of building materials, for example, ashlar blocks are more expensive than rubble construction if materials required importing from another region of the country. The landscape setting can determine the positioning of a church. Is the church a part of the community or is it sited away from the settlement? In which part of the settlement it is located reflects its importance. Do place-names or dedications of the church tell us something of the past history of the community the church is part of? The size of the church in relation to the size of the community can reveal if the area was wealthy or impoverished. The impressive churches of the Cotswolds reflect the wealth of the medieval sheep industry in that region. Did areas retain their wealth or did circumstances change over the centuries? Some parts of the structure can be grander than others built in different periods. 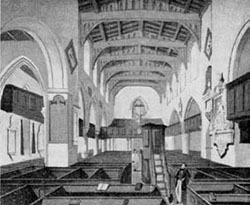 The proportions of the church and the relationship between plainness and decoration can indicate different attitudes and beliefs during periods of reform or the reformation of religious practices. 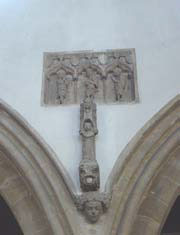 Does the pitch of the roof suggest the church had tiles or lead coverings at different periods? Internal decoration styles can indicate when building developments took place, for example, stiff leaf carving suggests it took place during C13th but ballflower designs were common during the following century. Tombs and memorials, both inside and out, church furnishings, fittings and fabrics, and evidence of former styles provide clues to the building’s development. The window glass and musical arrangements in the church highlight change. When did the organ replace the village band in the West Gallery? Building materials or sculptures from former periods can be incorporated into later developments such as Roman brick or Saxon sculpture appearing in later building phases. 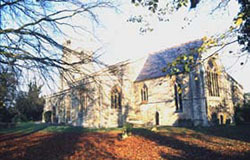 Churches are very often the oldest buildings in any community. They provide an important record of the social, economic and religious changes that have taken place over the centuries and warrant closer examination by those interested in the local history of the community. Tim answered questions at the completion of his talk. The evening concluded with a raffle and refreshments. The Meeting closed at 9:25 pm.